Welcome to our website. Here you will find technical information about our yacht, and warts and all details of our cruising experiences. 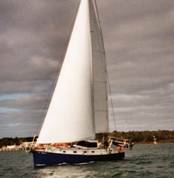 The Yacht...A brief history of the boat; information on the Radford 415 design; Masala’s specifications and full construction details. Cruising Log...The illustrated story of life aboard Masala and our adventures on the east coast of Australia. Cruise Log: 2009 June-Sep Moreton Bay to Fraser Island. Cruise Log: 2009 Sep-Oct Fraser Island to the Keppels. Cruise Log: 2009 Oct-Nov Keppel Islands to Brisbane.